Jamshedpur is one of the major rising industrial areas in Jharkhand. Located amidst the scenic beauty, Jamshedpur lures the corporate travelers from all parts of the world. 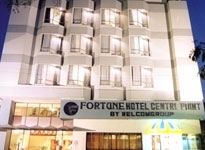 There are a number of hotels in Jamshedpur which are ideal all types of travelers in the city. Accommodations in the city are available in options of luxury as well as budget options. All modern comforts are offered in the hotels. Indian Holiday lists all Hotels in Jamshedpur. Book your stay with us. Browse through all options selecting the one suiting your budget and requirements.